It’s graduation season! This time of year it is so important to celebrate a young person’s rite of passage. We know that as proud parents, aunts, uncles, grandparents and friends that you will be snapping lots of photos to remember the special occasion. 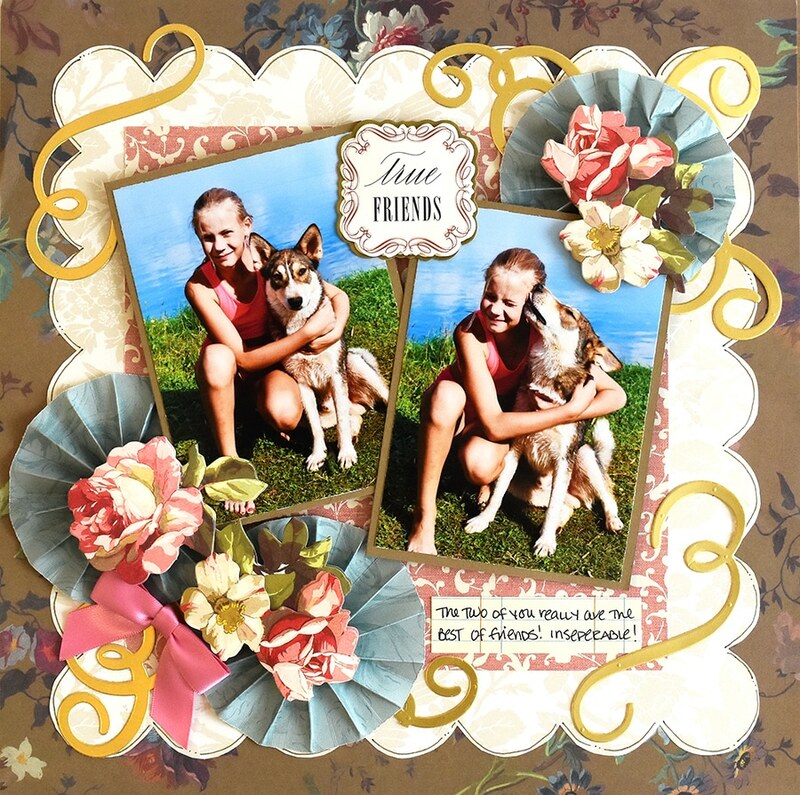 A scrapbook page is an excellent gift to give, or keepsake to display. 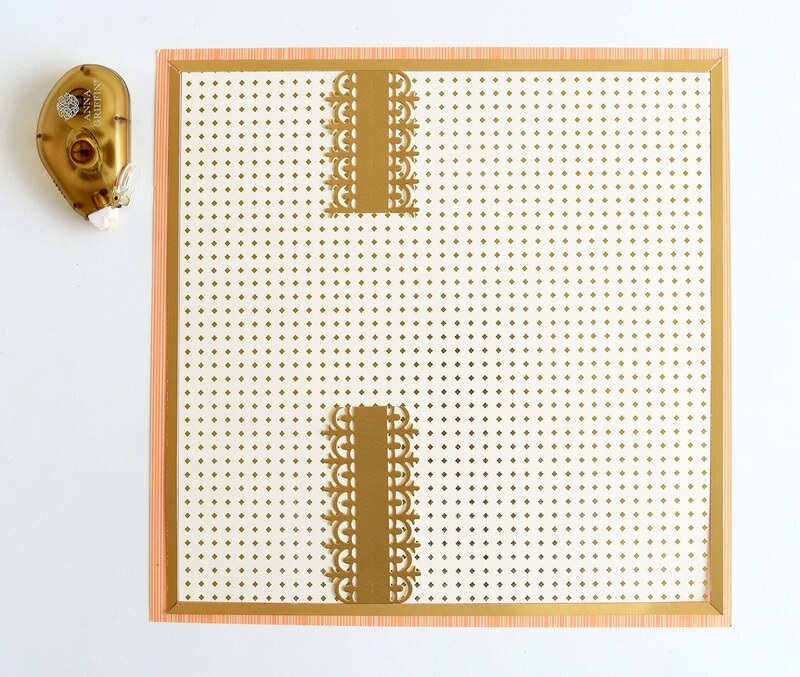 Today’s project is one that you’re going to love creating! Get out your Border Trims Dies and supplies, and let’s make this scrapbook page together! 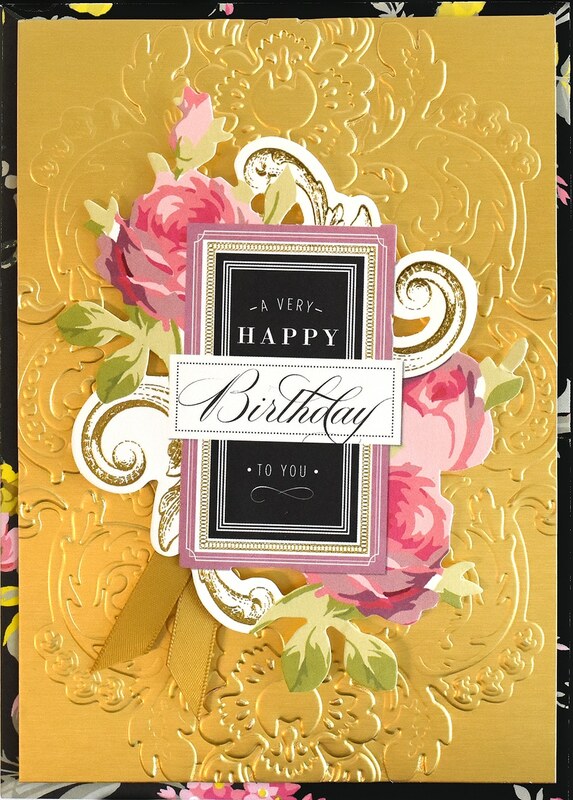 Using the Cricut® Cuttlebug™, die cut the 2 pieces of peach cardstock and 3 pieces of gold foil cardstock with the Border Trim die. (Note, we did not emboss). Cut one of the Border Trim pieces horizontally, leaving a 3” piece and a 4” piece. Set both pieces aside. Cut the two remaining gold foil Border Trim die cut pieces down the center, lengthwise. 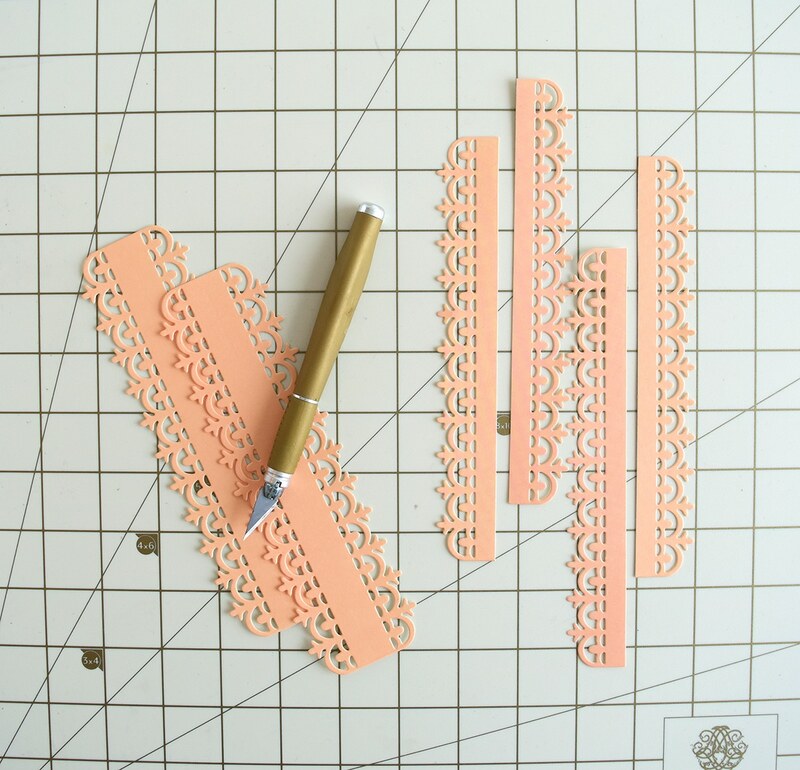 Repeat for the two peach Border Trim die cut pieces. Using the photo and cutting mat as a guide, cut the corners of the 4 long border trim strips at a 45 degree opposing angles to form the frame of the picture. This is called a mitered corner. Repeat by mitering the corners of the peach border trim strips. 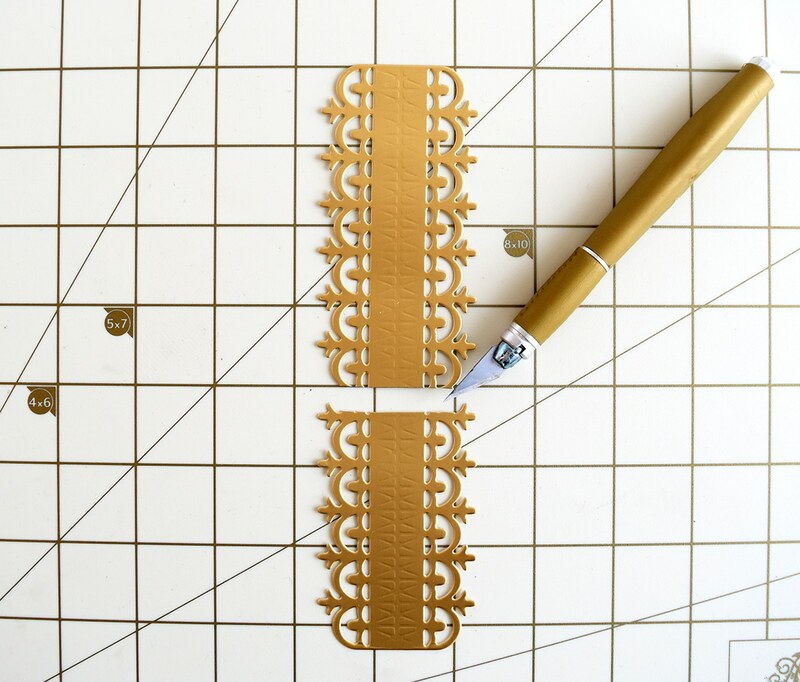 Using the cutting mat as a guide, cut each end of the ¼”x 11” strips of gold card stock at a 45 degree angle to make a mitered border for the edge of the page. Align the gold Border Trim die cut pieces along the four sides of the picture, making sure the corners align. 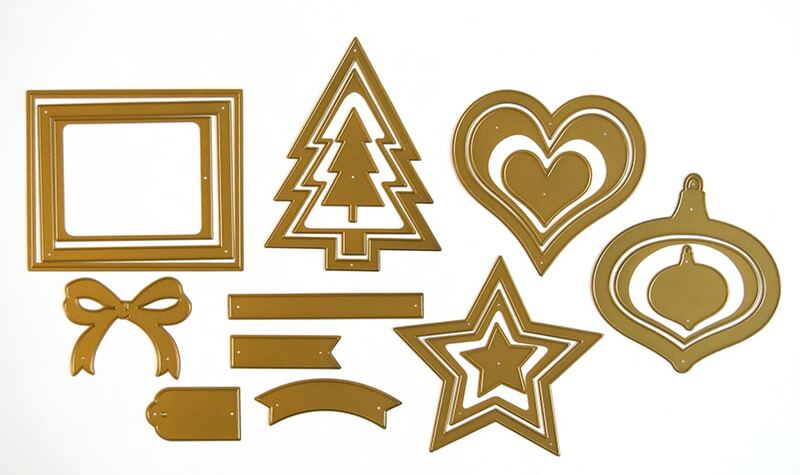 Place the peach Border Trim die cut pieces approximately ¼” in from the gold foil Border Trim Die cut pieces. Adhere using double-sided adhesive. 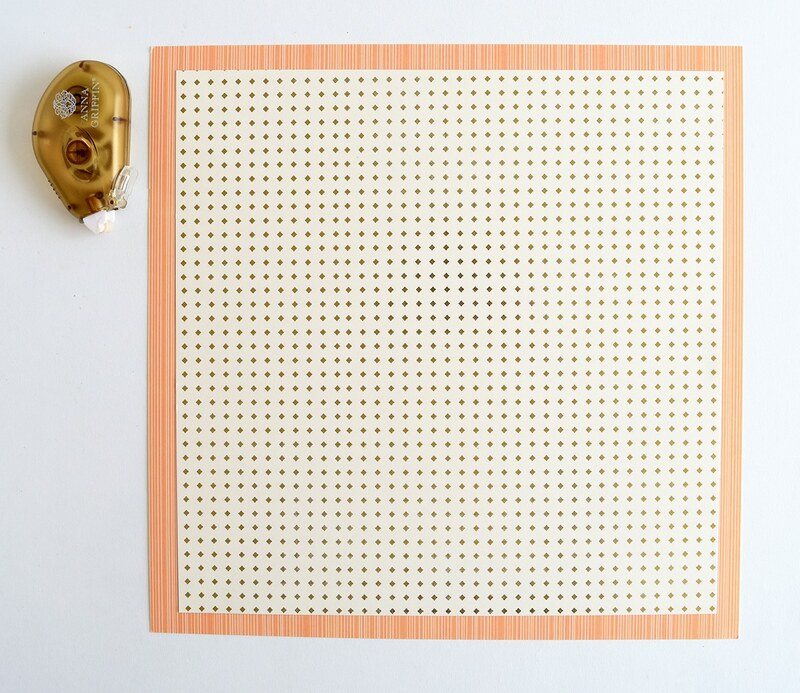 Using double-sided adhesive, adhere the white and gold cardstock to the peach striped cardstock. 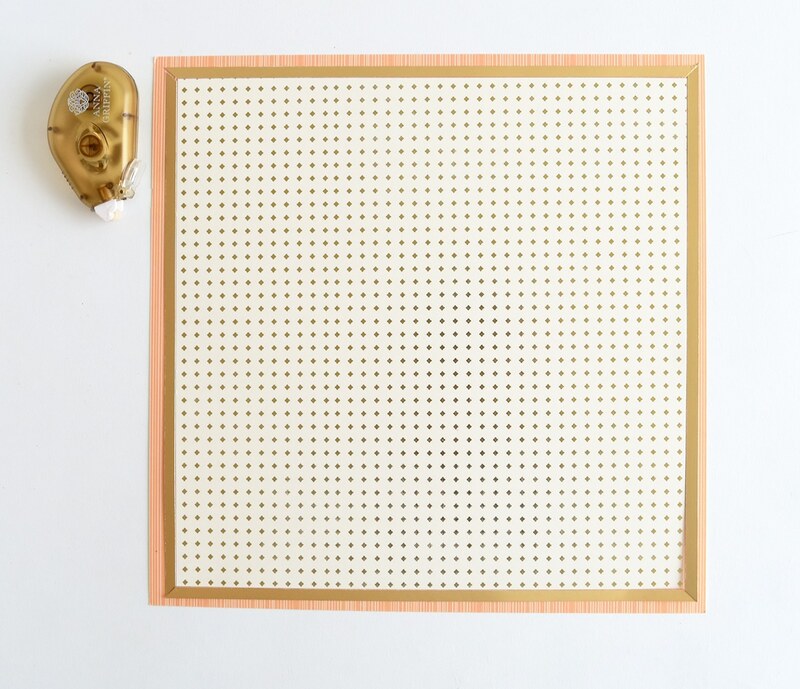 Align the gold ¼” strips of cardstock along the four sides of the gold and white cardstock piece, making sure the corners align. Secure with double sided adhesive. 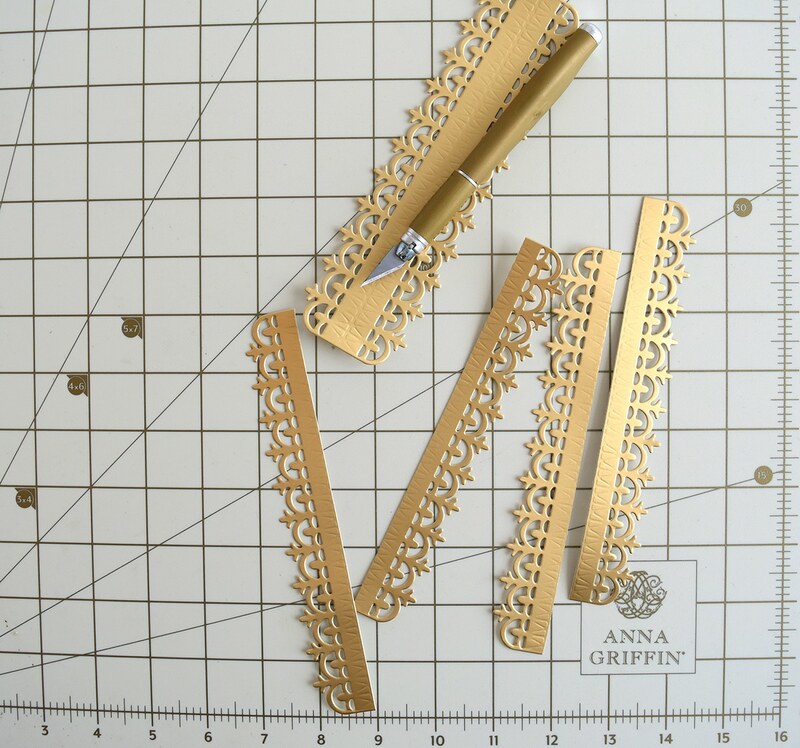 Approximately 4” from the left side of the layout, adhere the gold 4” and 3” Border Trim die cut pieces as shown. 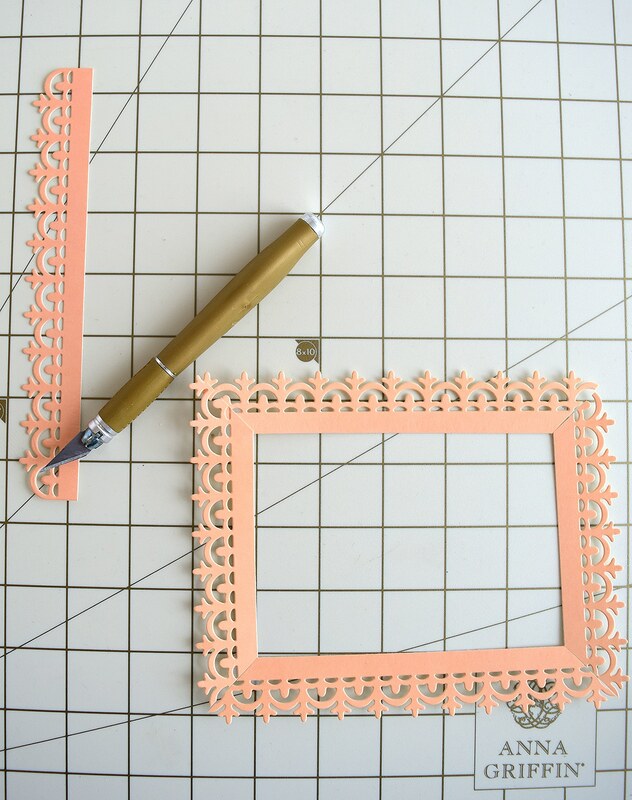 Using foam squares, adhere the photo and frame, making sure to cover the gap in the Border Trim die cut pieces. Adhere the journaling tag using foam squares. 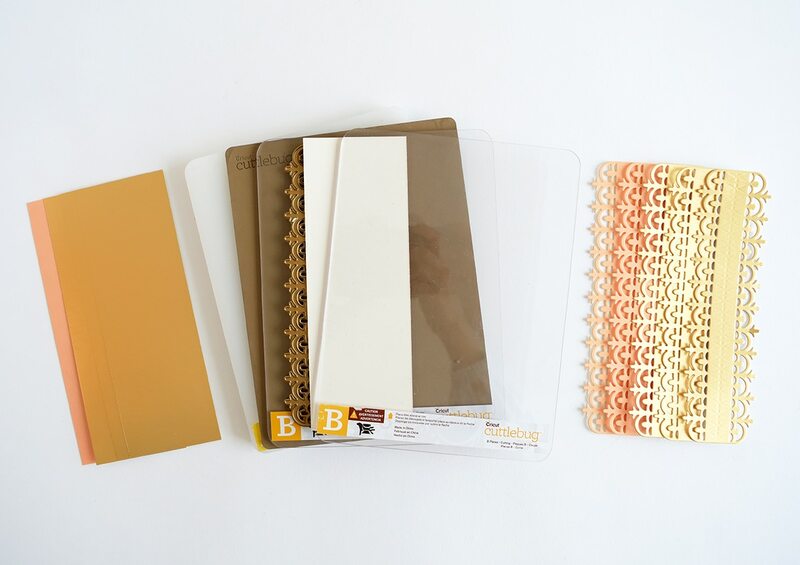 Using foam squares, attach the gold bow to the top of the journaling tag. Attach the floral sticker embellishments as shown. In just a little over a week we will be on air with QVC UK! Be sure to join us on May 30th for a crafty good time! This is our second to last preview of the items that we will be bringing you, and your shopping list will be posted next Monday, May 28th! Let’s take a look at another round of gorgeous crafts that are headed across the pond! 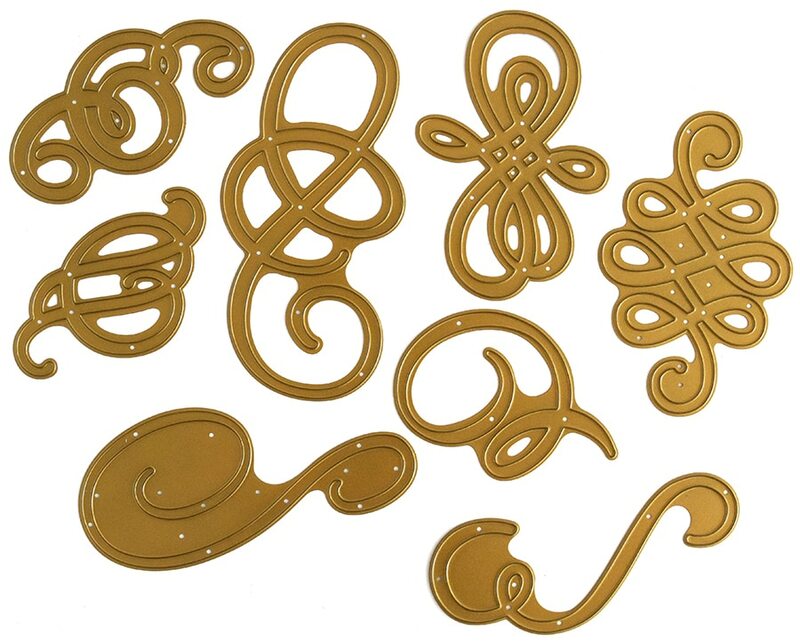 One set of dies that we cannot get enough of is our Fancy Flourish Dies! 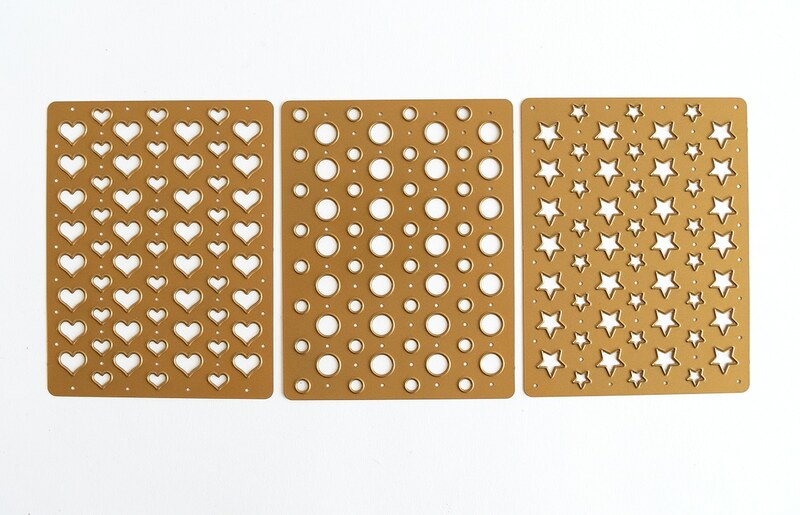 This set of 8 cutting dies create the most gorgeous movement you can imagine on all your cards and scrapbook pages. 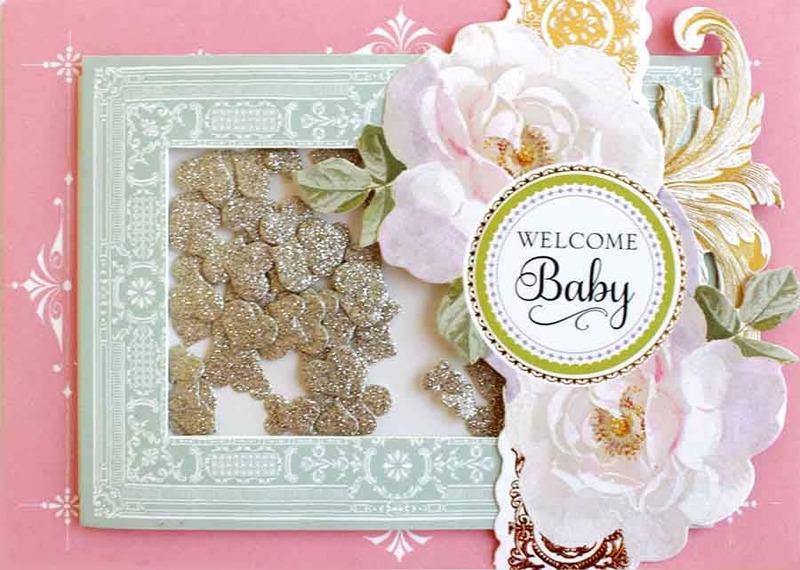 You can make endless diecuts with your patterned, glitter, foil or metallic cardstock! 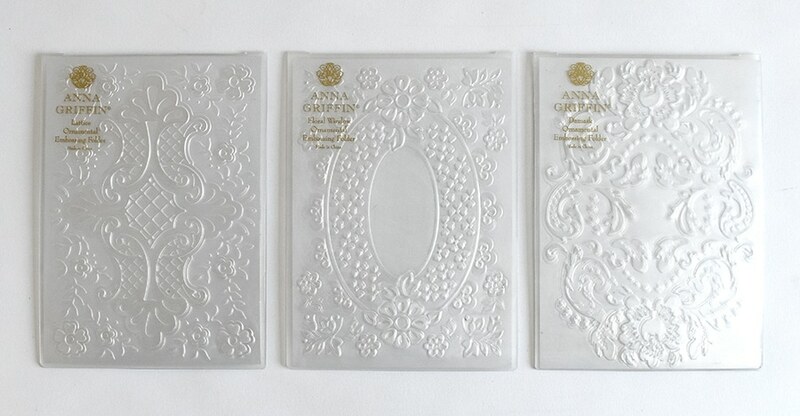 Say hello to our 3D Ornamental Embossing Folders! This set of 3 gorgeous folders are so intricate, and work beautifully with all of our crafting items. There are so many ways that you can use these folders! They are beautiful on their own, inked and embossed, cut into layers and so many more ways. You are sure to love this opulent set! You can make 20 shakable cards in an afternoon with our Shaker Card Making Kit. It is as easy as 1, 2, 3! 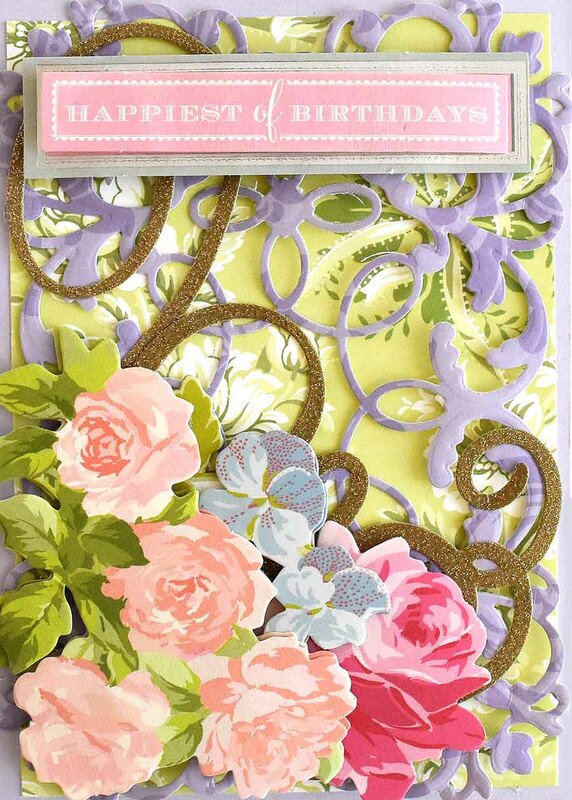 You’ll get pre-cut and perfectly measured card bases, coordinating layers, additional die cut layers, embellishments, flowers, sentiments and even envelopes! 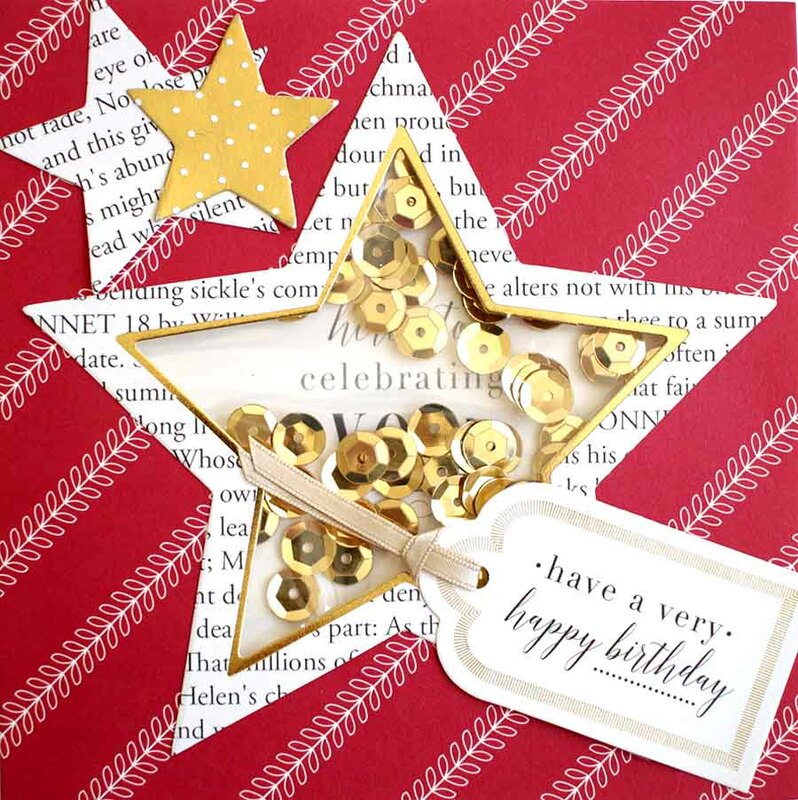 All you have to do is adhere the sequin pack, choose your layer, concentric layer, embellishments and sentiment! 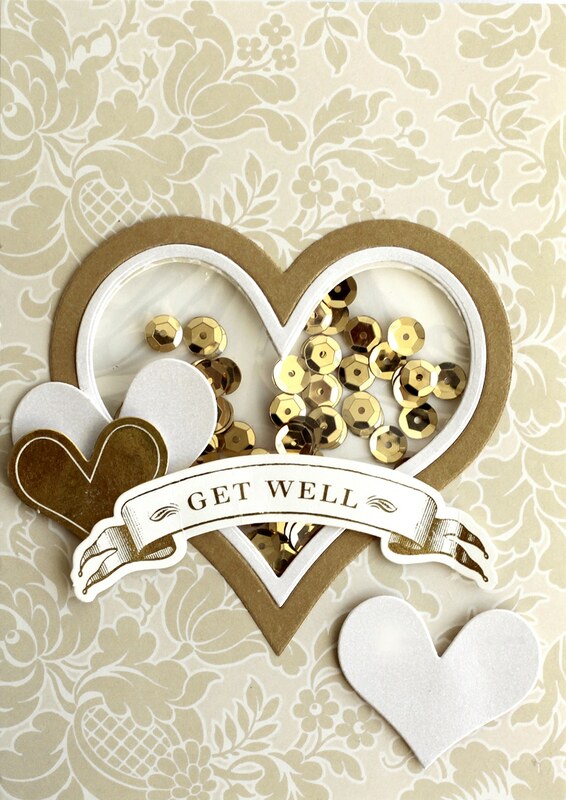 Create shaker cards for all occasions with our Shaker Card Dies! You’ll get 20 dies to create customized shaker cards that friends and family will love! The trio of shaker dies allow you to cut the window, layer and accessory diecuts to make adorable shaker cards every time! Also included are dies for tags, banners and bows! Of course you need something to go with your Shaker Card Dies, and we have our set of Confetti Dies for just that! 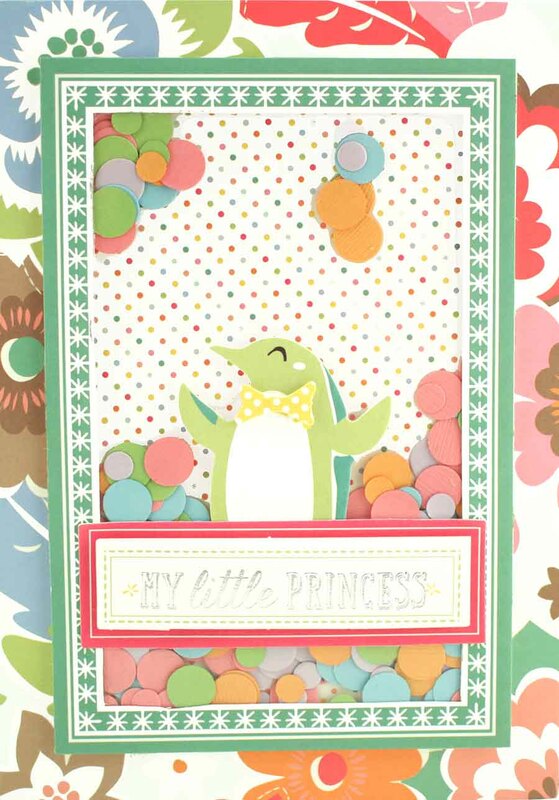 You will receive 3 cutting dies that cut two sizes of confetti in one pass through your Cuttlebug! 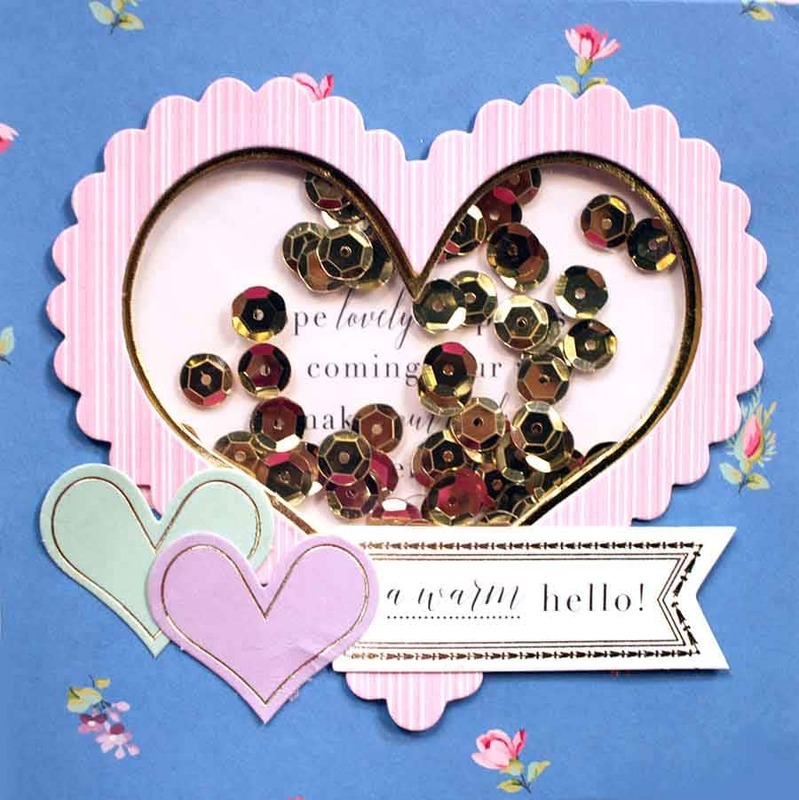 The hearts, circles and stars dies will create confetti out of your favorite paper for your shaker cards, party decor or even create a layer with the leftover paper! Are you making shaker cards from scratch? We have made it easy with this set of confetti bags and windows, complete with adhesive. All you have to do is layer, add confetti, unpeel and stick! There’s no measuring or mess, and you can easily get to shakin’! We hope that you enjoyed making today’s project with us! For those of you with graduates, give our congratulations to the class of 2018! In one week we start our previews for a very exciting 24hour Craft Day on July 11th. You aren’t going to want to miss it! I I love your tutorials & the scrapbook page, All of your things are so beautiful. It would be wonderful to win any of them. The precision of the Border Trims Dies goes so well with graduate cards and scrapbook pages; but these borders possess a classic beauty too like the architecture of a university library or an amazing church chapel. The Flourish die cuts can be useful in so many ways. We just need to use our imaginations. I know I’ll use these dies over and over again. They can bring movement to our creations. You provide such good inspiration for your products. You and your team open new doors for uses and displays, and by duplicating the elements, it takes them to a level I would not have thought of. Very pretty. Thank you. Love the graduation page. I need to make one for my grandson & this gives me a few ideas, thanks. I really love your products. They are beautiful. Love that scrapbooking pages are featured. Hope this trend continued. Thank you for these great ideas, especially the scrapbook layout. I really appreciate the inspiration and instructions. Would love to see a scrapbook idea that includes multiple pictures. Thanks for the frame directions and will be using that one. Those dyes have arrived and will start making some unique cards with the new designs. Hi Anna! nice tutorials! One suggestion I might add is when mitering corners I tape mine all together (precisely but loosely if that makes sense) before cutting through the corners and thus cut both corners at one time. That way if I accidentally wiggle my knife or if i’m not quite a prefect 90d (gasp!) then the two pieces of the corner still align perfectly. I learned that trick making many boards in design school. 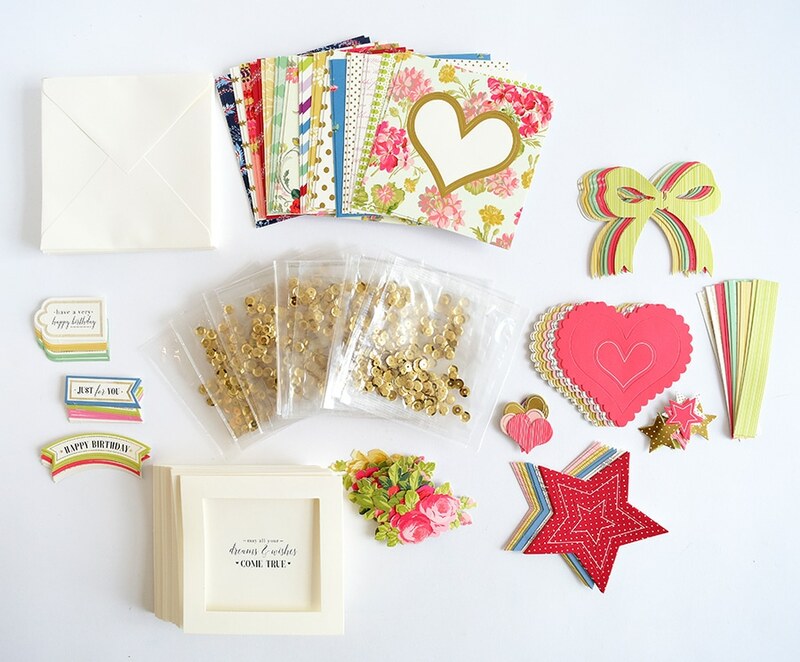 Love Shaker cards….and the confetti! Thank you for the great tutorial. I can try this with the border dies. Another brilliat idea from you. The cards and pages were great inspiration..
Aloha Anna! I’ve missed being connected everyday. I love this tutorial. Happy you’re able to share with your friends in the U. K.! I know they are anxiously waiting! I will be going back later to see all the fun scrapbook pages I missed from you & everybody’s shares! I’m visiting Burbank for my son’s graduation from New York Film Academy in the heart of all this film making. He was in the Army & getting a Bachelors in Fine Arts in Acting & Film making. My other son shows up. I have not seen them in way too long. I’m still here though! Aloha! So beautiful Anna, loved the peach and gold worked very well, certainly thinking a card use a similar color scheme! The red amaryllis is for me, a typical Christmas floral, but it was the perfect way to bring focus to the die cut frames! When I first saw those I thought I has missed a new die set of Anna’s but then noticed the mitred cut lines and said “A Ha!” moment. Makes me want to take another look at my borders stash and make more new frame die cut combos! I love the shaker cards, I wasn’t fond of them, but they really grow on you, I love the confetti dies. THANKS ALOT FOR WHAT YOU DO,. I love the look of the scrape book pages, but just never get the nerve to try out doing the arrangements. I would love to see some more masculine things though that I could use for my son’s activities and interest so that I could start a book for each of them along the way. So many beautiful ideas. Thanks for sharing! So many uses for the dies we bought! They are remarkable! Love you Anna. The grad card is inspiring. The formality of the dies make a great frame. The fanciful flowers are the best way to finish the composition. The border dies are really useful. I love the scrapbook page and really love your shaker cards. always beautiful. Thanks for sharing all these products and marvelous examples. Love, love all of them!Don’t know if I can watch QVC UK but so happy for getting your beautiful merchandise. Across the pind., It is their goodfortune. Again, I love all these products!!! 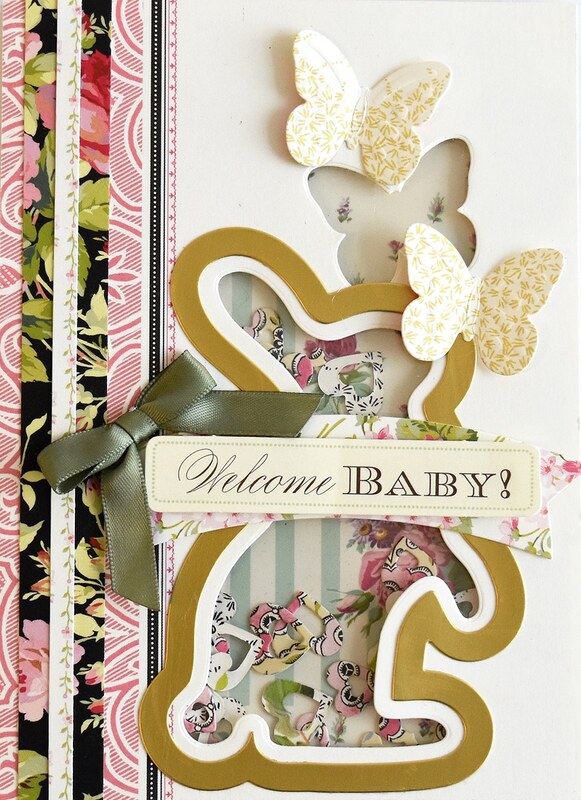 Love the Welcome Baby Butterfly card. So sweet! Have a lovely week! Those are beautiful scrapbook pages. I love the shaker cards. Happy Monday, Anna and your A-Team (‘A.wesome Team, of course)! 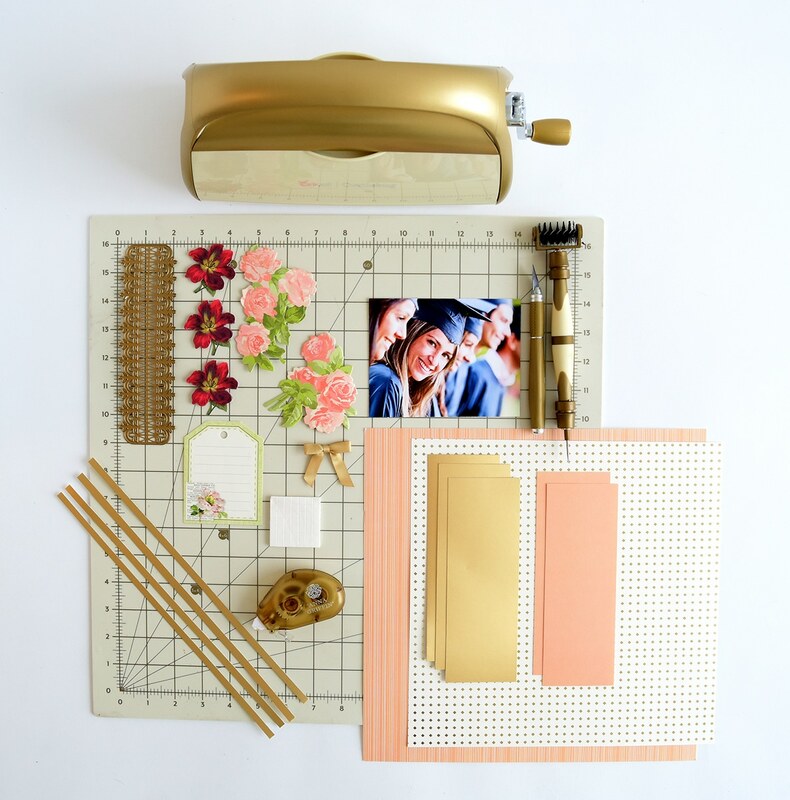 Your BLOG Is one of the most FUN things I look forward to on Monday, AND today’s Graduate Scrapbook is super-cute, framing the momentous moment using your newest 7-in. BORDER Dies! 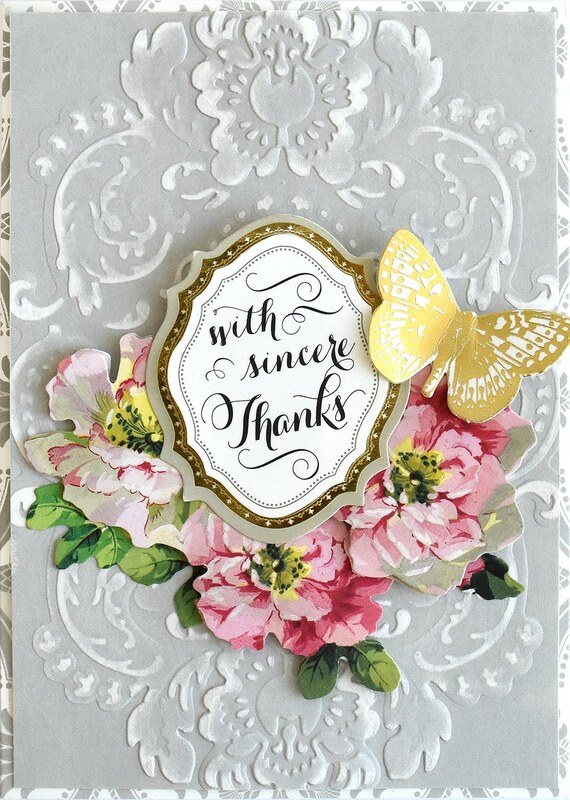 You know, die-cutting and embossing are truly my FIRST favorite of embellishing cards AND scrapbook pages–which I’ve enjoyed and accomplished much this National Scrapbook Month with your daily inspiration, Anna–so, THANK YOU! Best wishes in the UK; we all know how much our friends there LOVE YOU (as we do)! All these beautiful how-to’s and samples of album pages and cards prove that ANYTHING we imagine can be PAPERCRAFTED using your lovely products! 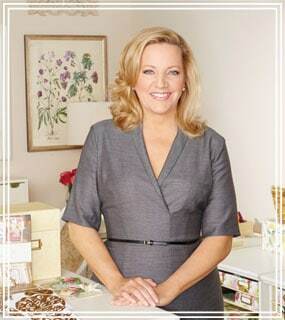 Already, I look forward to your next series of Product Previews ahead of your July 11 Craft Day on HSN–YIP! (((HUGS))) from South Dakota! Just getting in to the shaker card love the confetti dies on my list . Great format for the scrapbook page! That could be used for any picture. Beautiful creations. I love the shaker cards. I have all of the confetti dies that were in the auto ship program so thank you for the ideas. Lucky UK. I wish it was us even though I spent soooo much money on the 3rd I need to give my bank account a rest. See you soon. Have a good time in the UK. Tell them how much we enjoyed the royal wedding. Luv, luv, luv the embossing folders. Thank you so very much for the step by step directions to make these projects. … of course, after you place your cutting die inside of the template … Run This Through Your Machine For PERFET RESULTS. SAVE YOUR TEMPLATES AND REUSE ! It’s so much fun to see that die cut pop out ~~~ looking perfect ! Sending in a little tip, for the stamp treasury cutting dies. Should, individuals be having a difficult time aligning the smallest cutting die, over the stamped image ~~~ simply stamp your image on choice of card stock, then on a separate piece of heavy weight card stock ~~~ die cut the smallest cutting die, which is now your template … simply place this handmade template over your stamped image and align … tape on each edge of template and insert the cutting die inside of the template, as you will find it fits like a glove. There !!! … now, every stamped die cut will now turn out PERFECTLY ALIGNED !!! 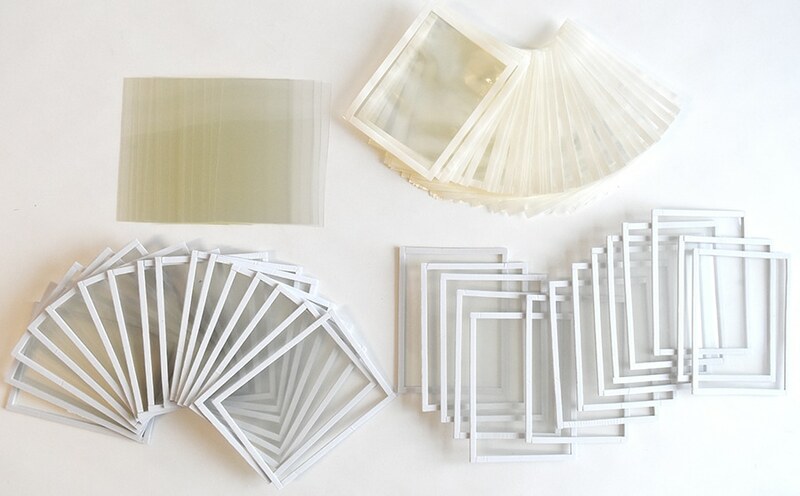 … and now you can have fun making your own templates, for each cutting die !!! Since they are featured on the scrapbook tutorial, just want to say how much I love the new border dies. They are amazing. They and such elegance to our projects! I love all these ideas and products. That penguin card is precious! HI Anna, as usual, you have great products to offer and amazing videos to help educate us. Your shaker cards re the best! I love the shaker card dies! Your team always has so many great ideas to share. 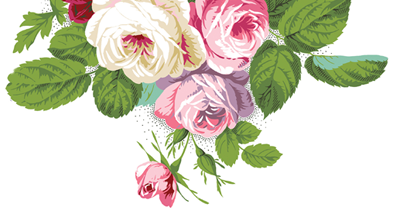 Hope to be able to get the Flourish dies as they look like they would add so much to cards and scrapbook pages. Thanks for your inspiration. Such cute amazing cards! 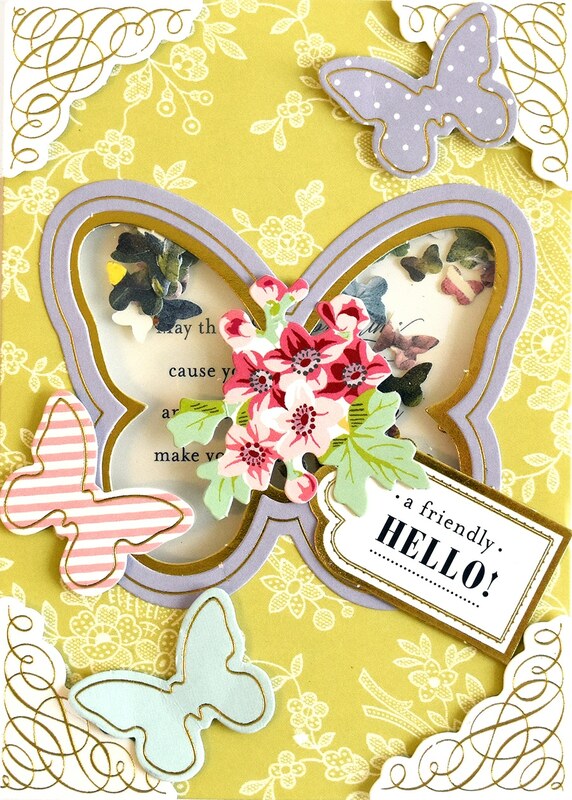 I used the Sympathy greetings along with the Birds and Bees diecuts to make some cards this weekend. 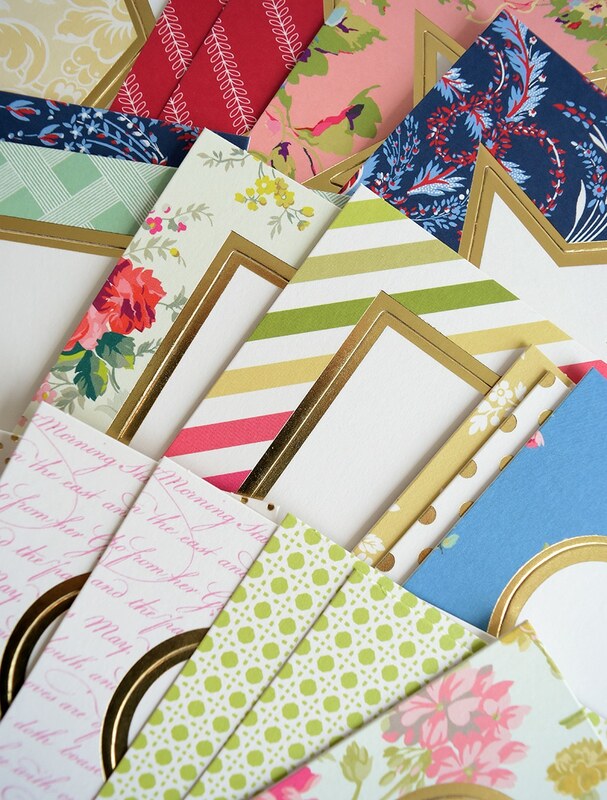 I love all the Anna Griffin products- so easy to create beautiful and tasteful cards! Have fun with our Crafty Friends across the pond. Your tutorials are FAB. A great way to use up scraps of our specialty papers. I know I’m not the only one who saves the scraps. Especially on our more expensive papers. Another fresh idea from the Halls if Anna. LOVE, LOVE,LOVE all of the inspiration from the graduation layout to the cute penguin shaker!! Love that you are going to have the confetti bags for shakers in the future! Great addition and makes it so much more fun!! Love your kits! Thanks for another great tutorial! 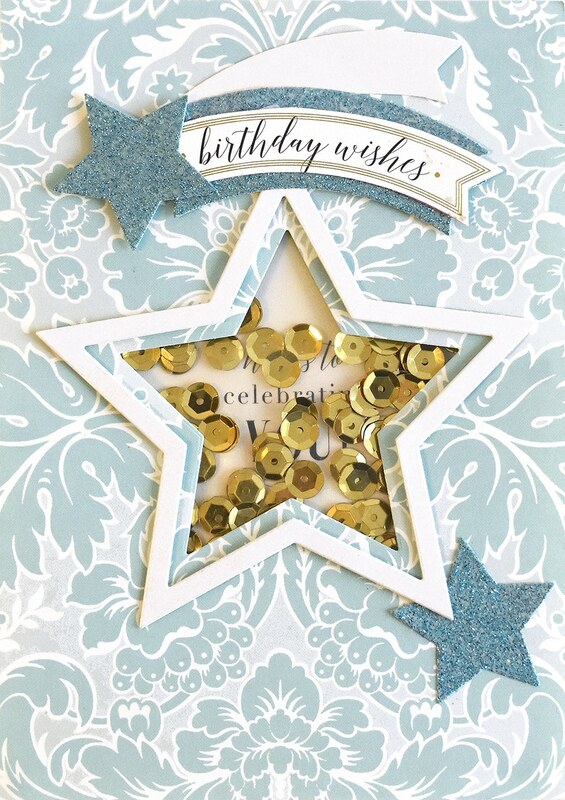 Love the versatility of this new border die! And one can always use a bit of FLOURISH! Love it all. but my most favorite is the dies and the confetti dies.the shakers packs are great to. ok love it all.